I know it's late, and I have many other things to discuss such as watching ducklings, tumbling classes, and picking berries, but this blog has become a way to store memories of N, so I had better write down some of the better memories, no? I mean, otherwise one day when I'm old and senile and reading these memories, I'll never remember things like the way in January when N saw a ton of snow for the first time, he pulled himself up onto the radiator covers and peered out of our house in awe. Easter was intriguing this year. A month prior, I bought a super cute basket, several plastic eggs, and some grass. A week prior, I bought some M&Ms to put in the eggs. Paul and I invited our next door neighbors (also known as N's honorary grandparents) to watch the spectacle of N hunting for eggs. I really didn't believe he'd be able to do it at all. Easter morn, I ran out of the house and planted the M&M filled eggs all over our yard and our neighbors' yard. I put them in very easy to spot locations. With a quick warning to our neighbors, we let N out of the house with his basket. I needn't have worried. 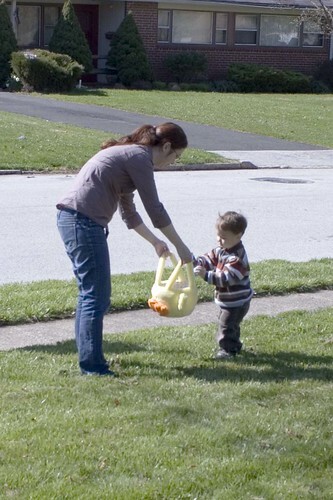 After I showed him the first egg and told him to pick it up and put it in the basket I was holding for him, he went on a tear, flying around the yard looking for eggs. 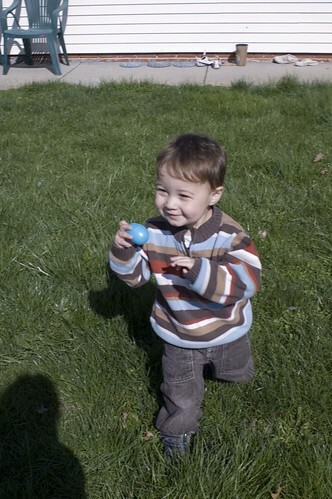 Sometimes, he'd be so jazzed about the whole event, he would run between locations, attempting to hold multiple eggs. After we got done the first go around of picking up eggs, I quickly hid the eggs again around our yards and he went for his second round of egg hunting! 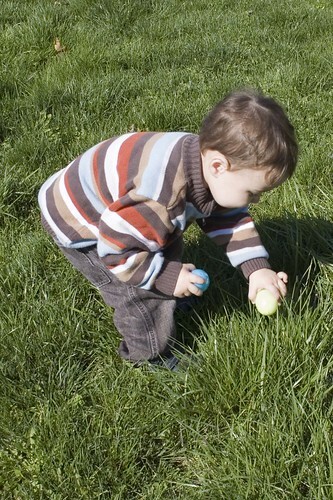 All in all, we went for three rounds of egg hunting. Also, the next two days, he'd peer around our yard like eggs might magically appear. What does it say about me that I considered hiding eggs in our yard the week after Easter just to see his egg hunting smile?